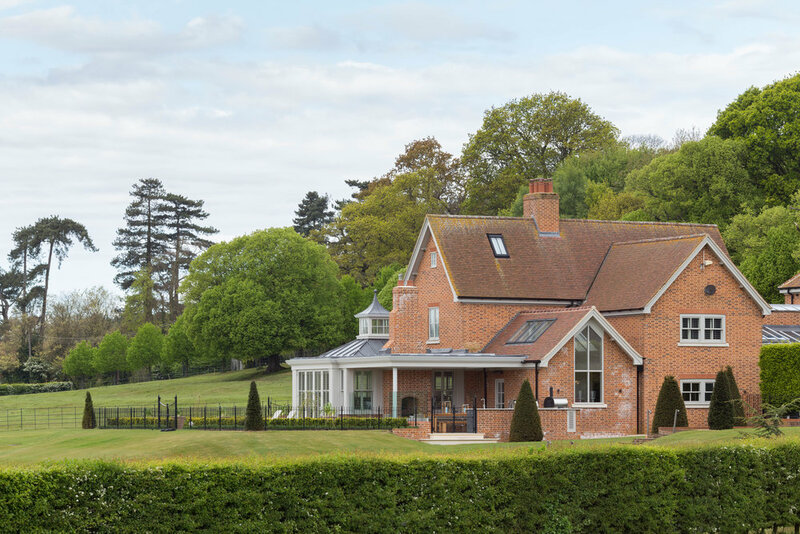 Patrick Allen & Associates Ltd designed a Day Room extension with alterations to the Kitchen and Dining areas at Brightwell Hall Farm, enhancing the living spaces of the existing farmhouse which is set within beautifully landscaped grounds. The al fresco dining area is screened by a glazed wall which protects from the elements yet retains its open feel and appearance, seamlessly melding internal and external spaces. Dramatic lighting creates an impressive ambience for entertaining guests at all hours. The kitchen extension with triangular glazed gable window and well considered roof lights breaks the boundaries between the inside and outside spaces.